Just a heads up that the next few posts will be easy slow cooker recipes. If you don't have one of these awesome kitchen additions yet, it's time to add it to the list. Seriously, don't waste any more time. I mean it–You will not regret this purchase! Crock pots are really inexpensive and a brilliant way to make healthy, easy meals during a busy work week. Believe it or not, I am new to working with a crock pot and am kicking myself for not having done it sooner. I have been using this one here by Hamilton and I must say that I'm loving it. It's really simple–which is how we like to do it here on mindfulbites! The beauty of slow cooking is you don't actually have to cook. This is great for those of you who: a.) don't have time to cook b.) are intimidated in the kitchen c.) don't like cooking, but love good food. All you do is the prep work– season, chop and plug it in then the crock pot does the rest. It's that easy! This is a stew I conjured up for a mom and daughter visit with old friends in Austin a few weeks ago. 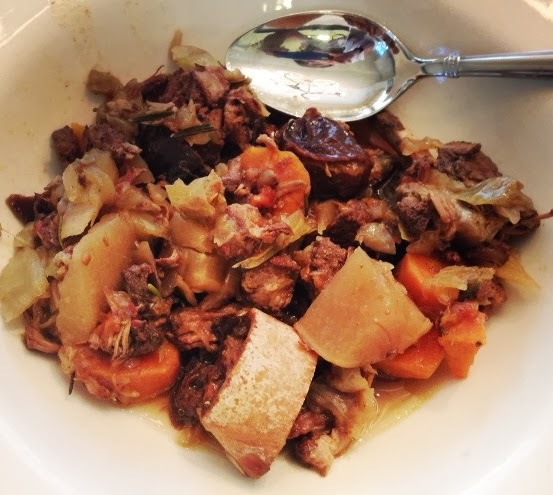 It was my first attempt to make something in the slow cooker outside of my weekly doses of bone broth and I was really pleased with the outcome. I can't stress enough how easy it is. Feel free to use any meat or veggies that you like in this recipe. You really can't mess up stews. Comment below if you have any questions or let me know how your version goes or if you have some creative recipes to share. As always, sending love! 1. Season meat with all of the spices (using half of salt/pepper and leave out rosemary for now) and brown on med-high heat for a few minutes on each side. Note: meat does not need to be cooked all the way through. Place meat in crock pot then cook onions until translucent. 2. Add sauteed onions and chopped veggies into slow cooker (leave out prunes for now). 3. Pour in water/broth and feel free to add more if needed. You won't need to cover all of the contents with liquid as the meat and veggies will give off juices of their own. If you want it thicker add less liquid, if you want more of a soup and are planning to put it on top of rice or quinoa, you can add more broth, stock or water. 4. Place rosemary on top and cover. Cook on low for 6-7 hours, adding prunes the last 10-20 minutes. 5. Add remaining salt and pepper, stirring to incorporate. 6. Turn off, unplug, grab a bowl and eat up!